Make photo slideshows with plenty of flash templates, easy! The best yet easy photo flash software to make gorgeous photo flash slideshows, then enjoy and share your photos on social media sites or with friends, you should try this mediaAvatar Photo to Flash. Import, edit, convert and share your photos as flash slideshows. This photo flash builder helps you create photo flash slideshows fast and easily by choosing from dozens of templates to create a theme, adding featured background music and effects, making photo flash into SWF flash, SWF flash+HTML or XML file and then uploading the photo flash slideshows to the web or sharing them with friends or backing up them on disc. With this fantastic photo gallery software - mediaAvatar Photo to Flash, quickly share your favorite photos and dazzle your friends with amazing photo flash slideshows! 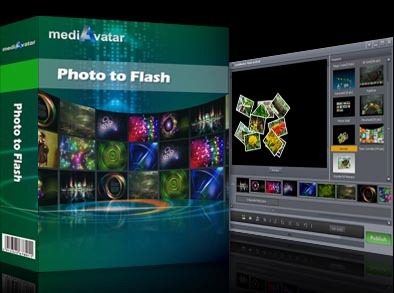 Download mediAvatar Photo to Flash for a free trial to create your eye-catching photo flash slideshows now! Drag & drop to import your photo collections (jpg, jpeg, png, gif, bmp, tiff, xbm & xpm), and create photo flash slideshows in a instant. Choose an eye-catching theme for your photo flash slideshow from a dozen of stylish templates (Exciting 3D templates also available) to simplify the photo flash making. Organize a series of photos in one place, change respective orientations to create a photo flash slideshow. Dub many background music into the your photo flash or loop one song in the whole flash. Fading effects can also be applied. Preview the template and effects of the photo gallery in real-time to get the intuitive view. Clip segment from music file, apply fade-in and fade-out effects, change the playback sequence of all background music, or make one song loop in the whole flash. Have more fun! This photo gallery builder has an intuitive design, making it amazingly easy to import photos, choose templatee, and publish your photos as SWF flash. This multilingual photo flash creator is available in English, French, Spanish, Italian and German. Convert videos to FLV format for easier upload on YouTube or other video websites.